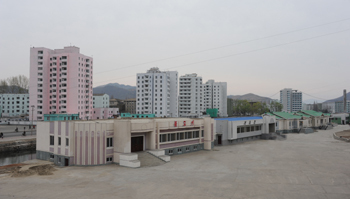 Pyongyang, April 24 (KCNA) — A street of restaurants was newly built in the Jungdok area in Phyongsong City, South Phyongan Province of the DPRK. There include houses serving casserole, noodle, tangogi soup and entrails soup. A meat shop was also built there, making it possible to improve the people’s diet. The street is decorated with peculiar display of colorful light. The restaurant street was featured on the evening news on April 16. 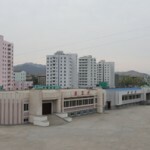 There are at least two other “Restaurant Streets” in the DPRK: Changwang Street in Pyongyang and Hoeryong, North Hamgyong Province. 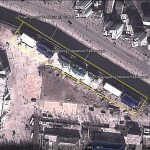 This entry was posted on Wednesday, April 25th, 2012 at 7:25 pm and is filed under Construction, Food, Restaurants. You can follow any responses to this entry through the RSS 2.0 feed. Both comments and pings are currently closed. I assume that “entrails soup” sounds more appetising in the original Korean.